URGENT!!! Appeals of the PUC’s conditional approval of Line 3 have been DISMISSED and now it’s up to Gov. Walz and Lt. Gov. Flanagan to instruct their new Department of Commerce to re-file a “Petition for Reconsideration” of the FINAL PUC order approving the “Replacement” project before the February 12th, 2019 deadline. 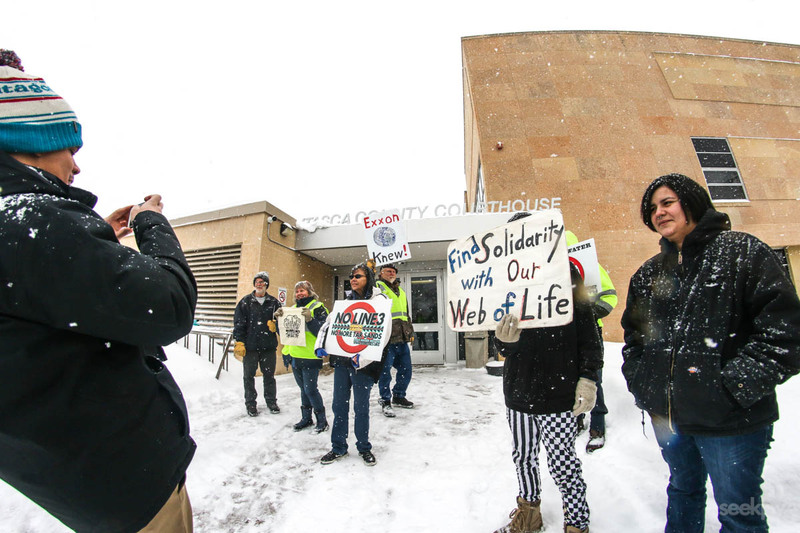 In the late morning of Monday, February 4th, 2019 four Catholic Workers participated in a non-violent direct action (NVDA) which forced the shutdown of Enbridge Energy’s Line 3 & 4 pipelines in Northern Minnesota. The day before Minnesota’s Department of Commerce announced their filing of an appeal of the Public Utilities Commission’s Certificate of Need Permit for the Enbridge Energy Line 3 “Replacement” Pipeline, about a hundred two-leggeds gathered just south of Duluth Minnesota to expose a hidden pipeyard where Enbridge is storing a massive pile of pipeline sections to be used in construction of the Line 3 Pipeline Replacement Project. 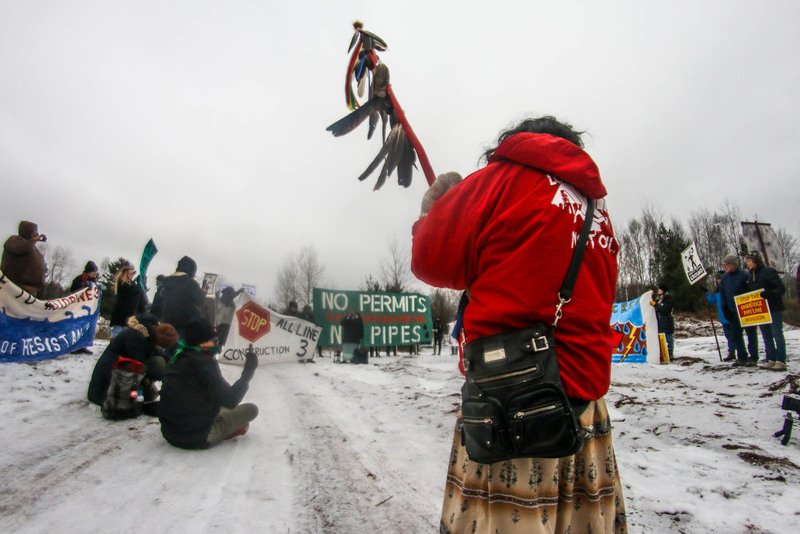 The action was organized by the Ginew Collective and supported by MN350, who chartered a bus from the Twin Cities in solidarity with the indigenous-led action. After a handful of beautiful speeches in front of a large banner that read, “NO PERMITS NO PIPES” the Carlton County Sherriff’s Department called for the group to disperse. This extended video recap is available on our facebook page as well as on the video playlist as part of the #StopLine3 initiative page on this site. UpCycled Lighter Sleeves from Landfill-Destined Jeans! So – without further ado… We’re super stoked to introduce a new line of SEEKJOY merch into the community marketplace! These little sleeves, designed to slip snuggly over a standard BIC™-style lighter, are upcycled from remnants of landfill-destined jeans that we have begun to intercept, seam-rip and re-purpose for various merch & goods. What better of a time could there be to talk about what we must do, as two-leggeds, to bring about radical social change and transform how we interact with each other and our natural environment? If, after looking into all this, that person you were speaking with brings to light this paradox it’s another chance for open dialogue and conversation, which is one of the first steps we believe is necessary in bringing about this radical social change. Anywho – back to these little lighter sleeves. As with most all of our merch, they’re manufactured using alternative energy. Yes, the embroidery and sewing machines are running completely off-grid on solar. 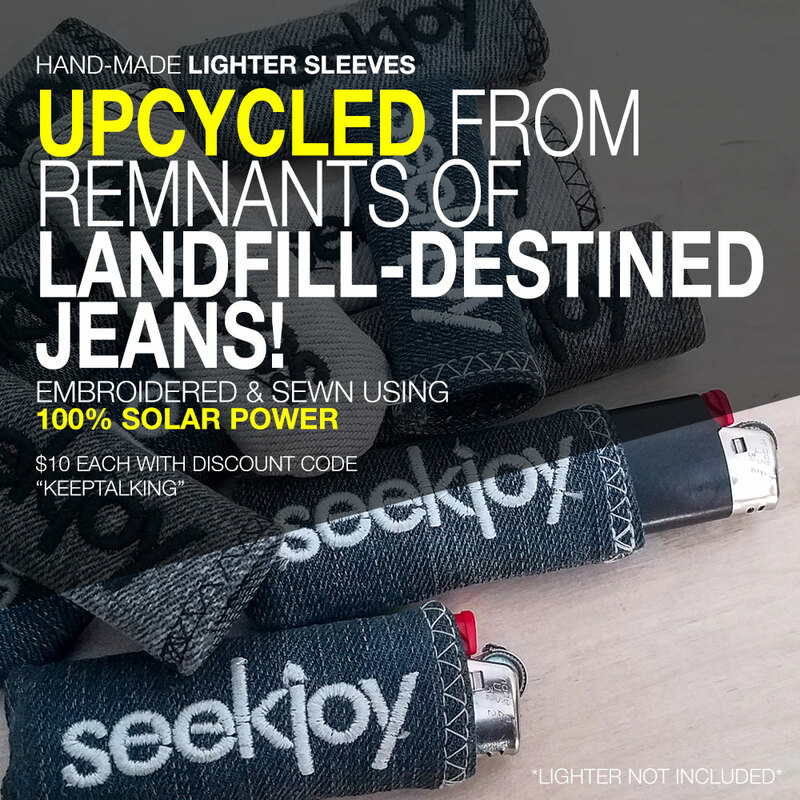 As we come across and intercept denim fabric from being buried in landfills, we’ll be making these Lighter Sleeves in small, unique batches and adding them to the SEEKJOY Community Marketplace. We’ve listed the sleeves for $12 each, but if you enter the discount code “keeptalking” (without the quotation marks) you’ll get $2 off each one so they’re really $10 each! The sun’s currently shining so we’re going to follow the age-old adage, “Make hay while the sun shines” and keep on sewing. Sending love to everyone out there supporting our work! Click the link below to view the current selection of SEEKJOY lighter sleeves from our pilot batch! 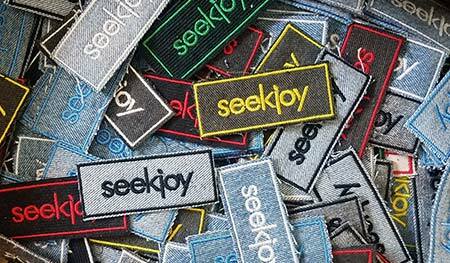 Click to View Current SEEKJOY Lighter Sleeves! It’s October 11th, 2018 and snow has fallen on the White Earth Reservation in Northern Minnesota. If you haven’t heard about the Enbridge Energy Proposed “Line 3 Pipeline” we’re encouraging you to get up to speed. Long story short, we as Minnesotans, Midwesterners & Mississippi River’ers have the choice to let a Tar Sands Oil Pipeline cross our headwaters or not. This pipeline is a 50-year investment in wrong direction. On October 11th, 2016, three climate justice activists engaged in an act of Civil Disobedience by forcing the shutdown of Enbridge Energy’s Line 4 and 67 pipelines in Clearwater County, MN. Grandmothers in Resistance – Let’s get ’em an RV! The Line 3 Pipeline Replacement Project required two regulatory components from the MN Public Utilities Commission in order to proceed to the next steps of the regulatory process. 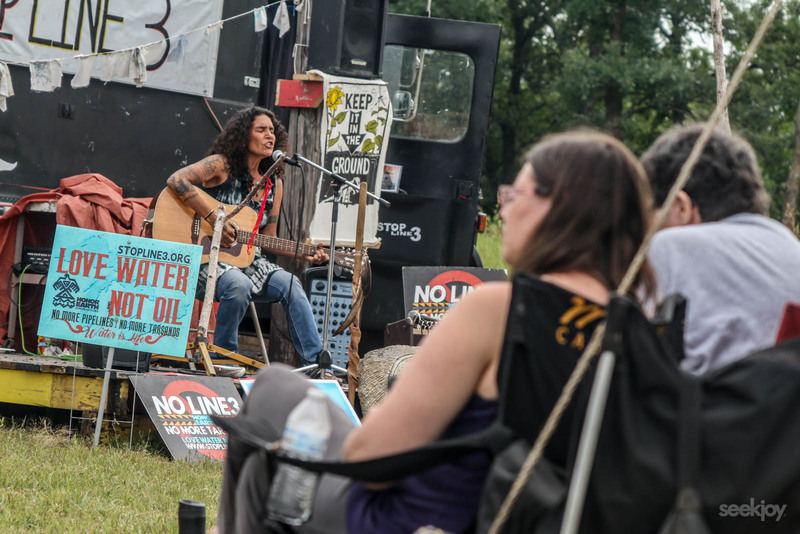 Camp Turtle Island, an Anishinaabe Cultural Camp inside the White Earth Nation, held a beautiful “Day of Resistance” Saturday, July 21st featuring live music from Sarah Cav-Cedars and Annie Humphrey as well as others who joined in throughout the afternoon during the open mic! Scott Russell with Healing MN Stories comments on the criteria for the Enbridge Line 3 Replacement Pipeline Project’s approval via the Minnesota Public Utilities Commission. We met Joel while in the Oceti Sakowin Camp where he was working as a medic and as media. In “When I Was Your Enemy”, published via Frontline Wellness United, Joel recounts his past-life as a soldier journalist and riot-control troop. Rep & Spread Our Mission! We're calling for radical social change and you can too - click the image below to view our current selection in the community marketplace!